Things have picked up nicely this week with some consistent catches of chinook and hatchery coho off the Capilano River mouth area. This fishery really gets going about now and for the next 30 days as waves of chinook show up on the flood tide and stack up off the mouth of the Capilano River. As mentioned there are some nice coho around as well. We are forecasted to get some rain on Saturday and this should bring in even more fish, as they often will focus on the river mouth with a low-pressure system coming in and a dose of freshwater coming out of the now very low Capilano River. If we get too much rain then the river will come up and some fish will go up the river, but it is still early for this fall fishery and there will be more fish coming later in September and even into October. Fish bait close to the bottom and you should do well. I often fish a herring on one side and anchovies on the other, as some days they will prefer one or the other. We have lots of herring and anchovies in stock, including some 6 inch anchovies, which are pretty hard to find and work well at the Cap. In fact we have 5.25, 5.50, 6.0 inch anchovies and few different sizes of herring in stock as well, so whatever you prefer, we have it. The big white springs also showed up this week down at the South Arm. The winds kept us from heading down there earlier in the week but some of the anglers that come out of the South Arm of the Fraser were able to get out for a few brief periods between the wind storms and they were into some big fish. I know of 2 chinook over 30 pounds this week from this area, so if you are looking to catch some of the biggest chinook of the year, now is the time to head to the South Arm. Just like the Cap, bait is key for these fish, but unlike the Cap, these fish are not on the bottom. The best depths are usually in the 30-80 zone on your riggers with 50-75 usually being the hottest zone, but sometimes you get a few deeper and a few shallower. Keep an eye on your sounder, especially in the shallower water close to the river mouth and you will often mark them and can fine tune your depths from there. A lot of the flashers and teaser heads discussed in that report are going to be 20% OFF this Friday, Saturday, and Sunday at our Fall Salmon Sale. 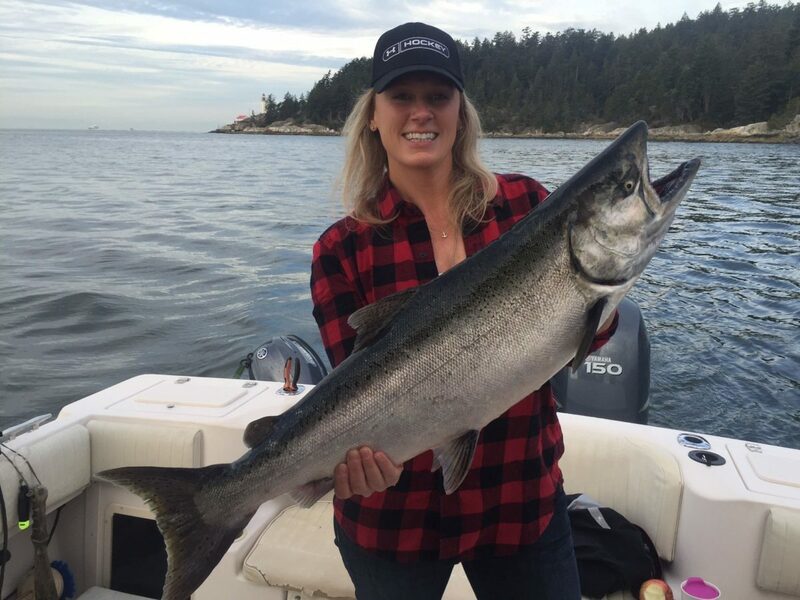 So enjoy the sunny September days as it is some of the best chinook fishing of the year for some of the biggest chinook of the year! See you in the shop or on the water!